Need To Learn How To Install Solar PV? 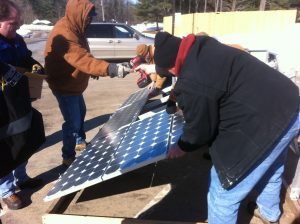 Now is the perfect time to expand your knowledge of solar installations!! SunMaxx Solar is offering a 5 Day Basic Photovoltaic Installer Course. Our Advanced Photovoltaic courses are geared toward PV installers and engineers who have experience with photovoltaic systems and offer participants an overview of residential PV systems in a format that includes a week of “classroom” learning. Sizing systems for both grid-connected and off-grid PV systems. Looking at the solar resource, the problems associated with shading and what is the best orientation and tilt for PV arrays. Discussing the basic sizing and design of systems to serve a given electrical load. Reviewing safety practices for installers and study the electrical code for PV systems in some detail. Studying various mounting systems for PV arrays and how they affect roofs. Concluding with the building of a working PV system. Professional engineers can earn PDHs for continuing education (12 for Advanced and 21 for Basic).